Patient readers, the usual! I’ll add some more material in due course, because there’s an immigration comment I want to draw attention to — but today is finally a sunny day, and I have some weeds I need to dispossess, to see the earth with wildflowers. –lambert UPDATE All done. To the weeds! “Trump Eases Demand for New Tools to Limit Chinese Investment” [Wall Street Journal]. “President Donald Trump suggested Tuesday that he will ease off his demands for tough new restrictions on Chinese investment in technology industries and will rely instead a 1988 law being updated by Congress that authorizes the government to review foreign investments for national security problems. ‘We have the greatest technology in the world, people come and steal it,’ he said in response to questions from reporters at the White House. ‘We have to protect that and that can be done through CFIUS,’ referring to an interagency group, the Committee on Foreign Investment in the U.S., which screens foreign investments to see whether they endanger national security.” • Hoo boy. Trump encounters “the interagency process.” Oh to be a fly on that wall…. “Transportation suppliers that have gone global are bracing for the impact of tariffs on their closed-loop supply chains. Cummins Inc. is preparing for levies on the products that the engine maker imports from its own factories in China to sell in the U.S. or use in its American plants. Cummins is among the many transport-equipment suppliers that have gone heavily international in recent years, creating complicated supply chains as they’ve sought to sell more goods in different markets while manufacturing components and vehicles in various parts of the world” [Wall Street Journal]. • Who among us doesn’t like complexity…. “Democrats Must Show Up to Win Back Heartland Voters” [RealClearPolitics]. “Nearly one-third of the Democrats now serving in the U.S. House of Representatives come from just two states, California and New York. Startling, isn’t it? Good for California and New York. But that statistic also describes how the Democratic Party has become a largely a bicoastal entity and has consciously abandoned much of the heartland… Ninety percent of life is showing up, the old adage goes. It’s a nice reminder.”• Abandoned the heartland to die, quite literally, as “deaths of despair” and the declining life expectancy figures show. Nice to know the political class can accomplish something, at least…. “Are Democrats Ready to Make Immigration an Issue in the Midterms?” [Amy Walter, Cook Political Report]. “Nitroglycerine. That’s how one long-time political strategist recently explained the politics of immigration to me. It’s one of those issues, he said, that can just as easily explode in your face as it can blow up the other side. Right now, it looks like the Trump administration is juggling bottles of the stuff…. Yet, even many Democrats are wary of overplaying their hand. And, it’s not just because of Trump. For years, Democrats have watched Republicans effectively cast their party as more concerned with the rights and comfort of illegal immigrants than the safety, security and economic livelihood of American citizens.” • Yes, it would be helpful at this point if Democrats addressed, however superficially and hypocritically, deaths of despair in the flyover states, and not with some [family blogging] training program or an off-the-rack opioid program. “Exiting the exit poll: The AP’s new plan for surveying voters after a not-so-hot 2016” [Nieman Labs]. “One hundred and seventy-four days remain until the United States’ midterm elections (902 until the next presidential election, but who’s counting) — which means there’s still time to “evolve” how polling is conducted…. The 2016 presidential election wasn’t polling’s shining moment, with many post-mortems pointing to opinion polls misleading election forecasters and underestimating now-President Trump’s support. It didn’t help that some polls were tied to news organizations that don’t really have the resources anymore to support this work — at least doing this work well…. These issues contributed to the Associated Press’ and Fox News’ departure from the Election Day polling data shared by the major networks last year. But now the wire service has built a new-and-hopefully-improved election data-gathering system made up of comprehensive surveys and online polling.” • Since there’s no particular reason to trust the election results absent hand-marked paper ballots, hand-counted in public, especially given the intelligence community’s increasing involvement in the domestic electoral process, exit polling can potentially signal discrepancies. “We Have a Crisis of Democracy, Not Manners” [Michelle Goldberg, New York Times]. “Over the last week, several Trump administration officials and supporters have been publicly shamed…. Naturally, all this has led to lots of pained disapproval from self-appointed guardians of civility…. As long as our rulers wage war on cosmopolitan culture, they shouldn’t feel entitled to its fruits. If they don’t want to hear from the angry citizens they’re supposed to serve, let them eat at Trump Grill.” • “Cosmopolitican culture….” As I climb one peak of liberalism, another, higher peak, Escher-like, continually appears…. No but seriously folks, I’m confused about all this. The Iraqi who threw his shoes at President Bush? Now he’s running for Parliament, so good for him. It’s also clear that if official Washington can’t break bread together, it can’t make deals together (no doubt what’s behind Schumer and Pelosi’s Bourbon-like statements). That said, I remember — as usual — when blogging began, and all of us who had been crowned “vituperative, foul-mouthed bloggers of the left” by David Broder made it our business to violate “civility” as much as we could. It was fun! Bush was elected twice. Then a con artist — Obama — took too many of us in. So it’s not clear that our various exercises in incivility really accomplished anything at all (besides a momentary jouissance of transgression). Of course, today’s exercise in callout culture is different in that shunning and shaming take place in physical space, as blogging does not. A minor concern: If you’re going to start shaming people in public spaces, and the people shamed tend to carry guns, your tactics may have unexpected consequences. More centrally, and speculating from a class perspective: I believe that the 10% who form the Democrats’ base suffered enormous ego damage from election 2016, because it called into question their right to rule (on behalf of their masters). So they’re acting out of a sense of sudden powerlessness, for which I should have more sympathy than I do. Now, if the “incivility” starts to happen on a bipartisan basis — that is, is perpretrated by people who do not believe that evil entered our sunny little world on January 21, 2017 — I’ll have more confidence such performances are conducted in good faith. I’d have even more confidence if they come to include the people who really run the country. An excellent locale for future incivilities would be fundraising events for the donor class. Both parties, of course. My aversion to answering right-wing hate with left-wing hate is strategic as well as moral. The R’s are trying to keep older, high-school educated white men angry. I want to show college educated GOP women there’s no home for them in vulgar, vicious Trumpland. The thing is, the left needs not merely to put a “DENT” in Trumpism, it needs to take over the Trump+Obama+Bush+Clinton+Bush+Reagan+Carter car and drive it in a different direction entirely. I don’t see how “disruption” does this. Note the qualifier, “Trump-supporting Republicans,” and compare to Begala’s tweet above. Raising a buck off refusing to expand your base to unregistered or justifiably cynical voters is always attractive. “Where the Wall Worked” [Politico]. “Tijuanans, though, tend to view the idea of yet another wall with indifference. ‘We already have two walls. I’m not sure what another one would do,’ says Miguel Marshall, a young entrepreneur in the city.” • Readers? Anyone who has experience with the, cleaned up Tijuana? I was going to hoist this by reader mMukluk from comments for further discussion, but it appears to have gotten plenty of thoughtful responses already, so I recommend that readers simply click through. Some quick thoughts of my own: (1) Recategorizing the problem from one of the nation-state to one of empire could change the moral dimension; in the same way that we owe the Syrian refugees succor from the wars we ourselves created, we owe (all? some fraction of?) Latinx migrants succor from the results of our own policies. (2) I don’t see a principled description of the role of the state. “The first duty of the state is to protect — care for? — its citizens.” I hear this from conservatives, but it’s really a lot like FDR’s New Deal compact, isn’t it? Should the state control its borders? Concretely, should there even be immigration checkpoints? If not, what is the role of the state, since the distinction between citizen and non-citizen seems to have collapsed. (3) It still seems to me that labor arbitrage is an enormous problem, and we have the example of H1B visas to show that capital — here, as embodied by Silicon Valley oligarchs or rather crooks — wants cheap labor, knows how to get it, and immigration is one way to get it. I don’t see this discussed very often, and by the open borders crowd, never. (4) I understand the appeal of amnesty: Millions have made their lives here, and deserve to stay, since we can hardly send those millions back. (I’m not up on the details of Reagan’s amnesty, but what I recall seems vaguely onerous. I’m also concerned, since Everything Is Like CalPERS, that in the eligibility determination process for amnesty — asssuming there is one? — we end up creating another horrid Rube Goldberg device like ObamaCare). But, again, I don’t see the principle behind it. Suppose we could magically deport the millions. Should we? If we do not, doesn’t that imply a “porous borders” policy where X number of non-citizen migrants builds up, and we give amnesty again? What kind of sense does that make? As I said, if the United States is to turn into a gigantic Mr. Lee’s Greater Hong Kong — pay $400 bucks, I think it is, and you get a passport — that might not be such a bad thing. But I need to be persuaded that all the systematic aspects have been thought through, and all the bad-faith yammering about babies doesn’t help that one iota. And my key issue is #3. So, readers, have at it. Richmond Fed Manufacturing Index, June 2018: “Manufacturing activity in the Fifth District continued to accelerate” [Econoday]. “Boding well for future strength was an increase in backlog of orders… While employment grew in June, firms reported greater difficulties in finding employees with skills they need*….” NOTE * At the price they are willing to pay…. And: “The important Richmond Fed subcategories significantly accelerated. 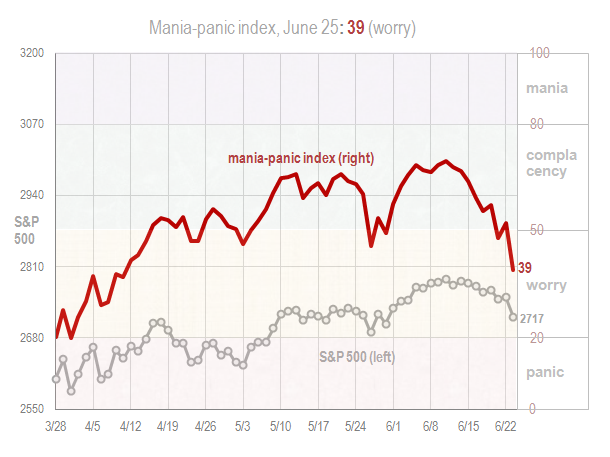 This was a stronger report than last month” [Econintersect]. S&P Corelogic Case-Shiller Home Price Index, April 2018: “Home prices slowed going into and during the early part of the Spring selling season with Case-Shiller the latest to confirm the softening” [Econoday]. “[P]rice concessions were apparent in last week’s existing home sales report for May and yesterday’s new home sales report as well. Demand strength for the Spring housing season appears to be less than convincing which for policy makers may actually be a plus given what may have been a pattern of overheated price appreciation last year.” And: “According to the data, prices increased in 17 of 20 cities month-over-month seasonally adjusted” [Calculated Risk]. More: “The swings in the seasonal factors has started to decrease, and I expect that over the next several years – as the percent of distressed sales declines further and recent history is included in the factors – the seasonal factors will move back towards more normal levels” [Calculated Risk]. And but: “Many pundits believe home prices are back in a bubble. Maybe, but the falling inventory of homes for sale keeps home prices relatively high. I continue to see this a situation of supply and demand. It is the affordability of the homes which is becoming an issue for the lower segments of consumers” [Econoday]. Manufacturing: “US Manufacturing: There’s Something Happening Here” [Industry Week]. “On one hand, it’s possible that the sector is in absolutely fantastic shape. The numbers certainly suggest as much—we’re currently at 21 straight months of growth in the industry, with U.S. manufacturing vacancy rates at just about a third of the 10-year average. At the same time… new manufacturing plants are suddenly sprouting up seemingly everywhere, while the regulations that many in the industry have long-argued stunt growth are being slowly peeled away. All of which seems terrific. However, it’s also possible that the sector is in deep trouble. Or at least dangling over the edge of trouble. The industry has found itself facing an array of potentially disastrous issues: a looming threat of a trade war, inconsistent tariff arrangements, a skills gap that shows no sign of narrowing, and thick inscrutability from the policymakers shaping the future, just to name a few.” • It would also be nice to know how many people are newly employed, net, and where, because of all this “growth.” Perhaps I didn’t get the memo…. Concentration: “Opinion analysis: Divided court defines credit-card networks as single two-sided market, rejecting antitrust challenge to anti-steering provision” [SCOTUSblog]. “Credit card firms sell transactions, the majority stressed, so plaintiffs must prove that the anti-steering provision increased the cost of transactions or reduced the number of transactions as compared to competitive markets. In this case, they failed to do so. Higher merchant fees were not sufficient proof and, in any case, might indicate a competitive market in which the consumer side of the market was receiving benefits, such as rebates or airline miles. Finally, the majority observed that the credit-card market has expanded, offering a larger variety of cards to diverse consumers and more credit cards overall.”• Frankly, I’m baffled by this, even though it seems important. Readers? Five Horsemen: “Unlike its peers, Alphabet is not bouncing back after yesterday’s rout” [Hat Tip, Jim Haygood]. “Apple never meant for you to spend so much time on your phone, Tim Cook says” [MarketWatch]. Cook: “We want people to be empowered from [their phones] and do things they couldn’t do otherwise. But if you spend all your time on your phone, then you are spending too much time.” • Something a hardware manufacturer can say without destroying their business model. This is Wild thyme (Thymus serpyllum) not culinary thyme (Thymus vulgaris). My thyme is very invasive, quite vulgarly. I like it a lot. This entry was posted in Water Cooler on June 26, 2018 by Lambert Strether. “A major Canadian music festival is facing an unexpected, tiny hurdle: a nesting bird who picked the site of the main stage to lay her eggs. A killdeer and her four eggs could delay the Ottawa Bluesfest from setting up for its 5 July opening. Construction of the festival’s main stage is scheduled to begin on Tuesday. The bird and her eventual brood cannot be moved without the approval of the Canadian federal government…..
….Killdeer are not endangered birds but are a federally-protected migratory species in both the US and Canada. Kildeer are wonderful birds. They resemble ballerinas. At dusk, they have kind of a plaintive, haunting call. Very familiar with Kildeer. If there is a young one near they will run around feigning a broken wing in an effort to draw you away. We humans make loud noises all the time without considering other living beings who might be severely harmed. And often we don’t even know we are doing that. Luckily, the eggs and the nest are visible this time, and the noisy gathering (to birds and other creatures, but not noisy, of course, to the noise, sorry, music fans) is postponed, and perhaps cancelled. “Why can’t you humans just sit quietly?”…in a room, alone….humanity…problems. Here’s an interview with Thomas Frank posted yesterday. Talking about his new book and the current political milieu. 10 minutes. Very nice to see Thomas Frank breaking through, at least a little bit, especially here in the Democrat Party utopia of Boston. One human’s wildflower is another human’s weed .. and I’d bet, as nectar is to bees, that somewhere on this rock someone is pulling their hair out, trying to figure out how to rid themselves of some ‘Wild thyme’ … what they would consider a noxious weed. No other species that I’m aware of obsesses over such questions as to why and how to manipulate or terraform their world .. even if it’s only a tiny speck of dirt ! Does wild thyme have the same herbal qualities as culinary thyme? Patience Gray in her great Honey from a Weed writes that both serpyllum and vulgaris are good for cooking. She recommends making a kind of thyme broth as a restorative. She recommends serpyllum on hare, because hare eat thyme. She also writes that Thymus capitatus, even more pungent, is good against a hangover. Wild thyme is famed for the honey bees make from its nectar. Hymettus honey from Attica in Greece, being the most renowned. To me the wild thymes are stronger than the culinary thymes — approaching oregano in pungency. Among the culinary thymes, there are varieties of “common thyme” known as German and English Thyme, respectively. I guess they grow well in those countries. 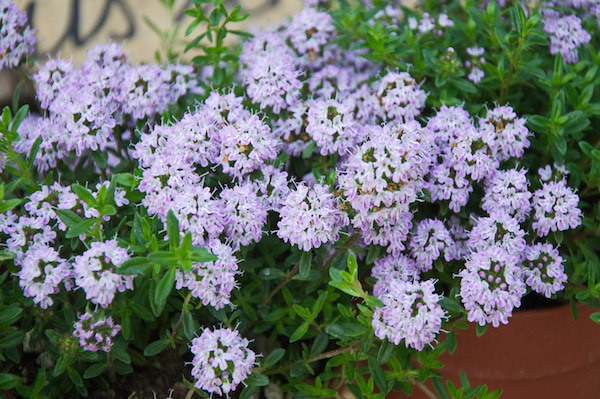 Then there is French thyme of Provence which has smaller, finer leaves and is reputed to be more delicate in fragrance. I always hopefully buy plants of this to pot up, sometimes in multiples, and over a period of many years it never made it through the winter, either indoors or outside. Except last year when I had pots of it both outside in the garden and indoors on the windowsill and they all made it, to my great astonishment. So now I have four big pots of French thyme, more than I could ever use to cook with. I don’t know what I did differently. Conditions in my north-facing Brooklyn backyard, dank in winter and like a steam bath in the summer, are not the best for herbs. If you are considering only culinary uses, T. serpyllum and vulgaris are pretty much interchangeable. If you are including medicinal aspects, different species can have different chemical profiles (called chemotypes) that provide different therapeutic effects. Different chemotypes exist within species as well. In aromatherapy, you will often find essential oils of thyme and rosemary designated by chemotype (for example, Thyme (eugenol) for a thyme eo especially rich in the component eugenol). I’ll have to ask my practicing herbalist friends whether they differentiate their materials similarly. There is a Middle Eastern thyme, za’atar, (Origanum syriacum), which is used in Palestinian and Israeli cooking, which has a very robust but aromatic flavor. I was unable to get this to survive the winter, so I buy it dried with sesame seeds and sprinkle it on bread. (It is good on anything). Wikipedia says various herbs can be used for a za’atar mixture, including the shrubby thymus capitatus (used to make Sicilian honey). The authors of The Fragrant Year (1967), a book that impressed me greatly in my youth, thought that some of the ornamental thymes, lemon thyme, so called, for example, smelled like turpentine. I don’t know if this is true or not. I expect there is a lot of variation even within species, as the previous poster said, so one must experiment to find what pleases one’s own nose. Somehow, I can’t imagine anyone thinking of thyme, wild or cultivated, as a weed. It grows on scrubby mountainsides and seaside cliffs, where other plants don’t. U.S. benchmark oil futures rallied Tuesday, topping $70 a barrel for the first time in more than a month. News that the U.S. is pushing for countries to cut Iran oil imports to zero by November, uncertainty surrounding Libya output and doubts over OPEC’s ability to lift output quickly enough to avoid a shortfall all contributed to oil’s gain. August West Texas Intermediate cruderallied by $2.45, or 3.6%, to settle at $70.53 a barrel on the New York Mercantile Exchange. That was the highest finish for a most-active contract since May 24. Japan and China are both traditional buyers of Iranian oil. The US attempt to shut off Iranian exports is a flagrant act of war not only against Iran, but against its customers. Last time the US tried to shut off Japan’s access to oil, a regrettable incident followed at Pearl Harbor. Well, it’s got the dollar-doomist excted. (Tusday? Already?) My you-tube inbox is filled with dire predictions of the iminant colaps of the US dollar being played over imiges of the latest zomby-appcolips TV shows. Rumor has it that Trump and Putin will be meeting next month so they will work it all out there. Or rather Putin will tell Trump what to do after saying the hypnosis trigger word. Here in the scorching South our gas prices are going down. The reign of error is the demandchurian candidate? If gas prices are going down in the scorching South, that should encourage more driving. Which should cause more carbon skydumping. Which should do its little bit to help the scorching South scorch even more often, harder, longer in the future. But of course so will many other things. Every little bit hurts. I hope they don’t waste, sorry, spend all their energy on one guy….save some for, say, the Russian embassy. It’s not really game on until somebody gets tarred & feathered. The fundamental difference between the coup in Ukraine and events here is that the coup in Ukraine was orchestrated from outside. Up here in Canada we’re offering the Titanic. It’s being patched up using US steel, or is it steal? The trump outfit needs only to send Hal-i-fax, and be prepared to use up most of their sinking funds. Is that the same Stephen Miller as the one in the 3:30 pm post? Or are they going after all Stephen Millers in luxury DC apartment buildings? It would be nice if there was a democratic Stephen Miller to protest against as well. I was mentally going through a list of donkey show minions, and nobody even came close in horribleness-a hard act to follow, sorry. Come to think of it, Hillary is no minion. They should leave her alone. Youtube makes this a good time to learn to play an instrument, e.g., guitar. I’m only in favor of these personalized protests if they go distinctly and totally BIPARTISAN. Please, rattle some elite cages….but do so across party lines! Right now, harassing people over the immigration policies which have been in place for about a decade, is basically useless and will probably produce a backlash and boost Repub turnout in midterms giving Trump a chance to push his law-and-order for theme again. As for the Blue Wave….dem messaging looks like this…. If the Dems want to make voters overlook the party’s lack of ideas for giving concrete material benefits to the people, the circuses have been pretty good so far. I think a “bipartisan” backlash is the fear of Pelosi and others. She eats out, and despite a powerful position in the Democratic Party, the Democrats failed in 2009 and 2010 to fulfill their promise of raising the minimum wage for restaurant staff. Democrats have bravely made bland assurances they will pursue a bill once again. Given the hideous student debt out there, I would be astonished if a guy like Joe Biden ever eats a meal that isn’t mostly composed of human secretions. Hucklebee Sanders is not being treated as a celebrity. If people recognize the press secretary from the White House press briefing (possibly the dumbest of DC’s many useless traditions), they will recognize others. Look at how “progressive” Cory Booker has become since he was hounded over his vote on behalf of Big Pharma. I’ve been convinced part of the appeal of HRC’s candidacy for Team Blue elites was the nostalgia factor Hillary could muster that lesser celebrities simply couldn’t. No Guatemalan kids and their parents desperate to flee US-sponsored regime change running north for the American dream….nope, just poor white and black people left behind by de-industrialization (another bipartisan project) and caught up in a power and money grab through the anti-democratic ’emergency manager’ mechanism to help Nestle carry out their disaster capitalism project of stealing Michigan’s water so they can sell it back to them. But don’t worry…Nestle’s kind enough to give Flint residents a free bottle of water per week!!! It’s really hard to think of a better story that sums up what’s wrong with American than Flint. My guess is that Peloai an Schumer have been hearing from ICE contractors who have also been shamed at their homes by metro dc dsa and the mic part of the Democratic donor base is not happy. But mostly Versailles Washington is appalled the might be consequences for big shots. Right wingers are good at sniffing out lib hypocrisy. Not to mention Dems wont do a thing for anybody unless they feel some heat too. > Please, rattle some elite cages….but do so across party lines! Yes, by all means, protest every elected official and their minions. The bulk of them certainly deserve it. This goes to show just how clueless they are. If this is their biggest concern, they’re really going to be caught flatfooted with what comes next. Well, there they go again — that mysterious cabal of sellers who knocked about 70 points off the Dow during the final hour, when the big boys trade. They get it — when the blue chip companies of the S&P 500 derive more than 40 percent of their sales overseas, Trumplary Twitler’s war on global trade means nothing but bad news for corporate America. When Bubble III blows, so do several trillion worth of pensions, and probably too that relentless 6%-a-year rise in house prices which has the middle class feeling flush again. Put maniacs in charge of the asylum and pretty soon the whole building’s aflame. Trump suggested Tuesday that he will ease off his demands for tough new restrictions on Chinese investment in technology industries and will rely instead on a 1988 law being updated by Congress that authorizes the government to review foreign investments. “We have the greatest technology in the world, people come and steal it,” he said. “We have to protect that and that can be done through CFIUS,” referring to the Committee on Foreign Investment in the U.S. which screens foreign investments for national security impacts. If Mr. Trump’s decision holds through June 30, when the new policies are to be announced, it would represent a significant backing away from his threats against China and a possible olive branch to Beijing before the July 6 imposition of tariffs on $34 billion of Chinese goods. Industry lobbyists and China experts who follow the issue closely attribute his shift to recent declines in the stock market and to U.S. companies getting battered by tariffs in U.S. trade battles with the European Union, Canada, Mexico and China. Unfortunately confidence already has been dinged by the Orange Charlatan’s impulsive flakery. Now the Trump admin is gearing up for another useless battle with Asia, arrogantly demanding that they stop buying Iranian crude. The hits just keep on coming from the Trump-Navarro-Lighthizer clown posse. A lot of people seem to be center their lives around appeasing the S&P deity. And it looks like there is another happy-ending Dunkirk, for Beijing’s buying agents. For the overseas sales being referenced in what you said, is this sales that contributes to US GDP? And is therefore considered an export of the US? Or is this sales numbers that are generated using foreign operations and therefore doesn’t contribute to US GDP? Or a division between the two? I think there is much less complexity here, and more disingenuousness, than meets the eye. Building your own factory in China so you can export those parts back to your assembly plant in the U.S. is not a complicated supply chain. It is wage-arbitrage outsourcing, pure and simple. Also “creating more complicated supply chains as they’ve sought to sell more goods in different markets” seems carefully worded to create a false connection. Complicated supply chains do not make it easier to sell more goods in different markets. Except for the wage arbitrage. That’s my reaction. Who’da thunk that moving your supply chain across half the world has some down sides? One might hope this is the first wake up call as we climb down from the End of History. Anyone who has experience with the, cleaned up Tijuana? I only know the old Tijuana of donkeys on the street painted with stripes so you could get your photo taken with a mock zebra, jai alai games @ the fronton where it seemed as if they held up the matches until you got your bet down-with ice cold Dos Equis served @ your seat for a buck, tacky souvenir store after tacky souvenir store, all selling the same junk that I first saw in the late 60’s, when my dad made sure we saw how the other half lived, south of the border. Later on it became a mecca for getting a drink, well many, until I was 21 and it was no big deal. I haven’t been to TJ in donkeys years, I asked 7 San Diegans from our ski group a few months ago if anybody ever goes to TJ or Rosarito Beach anymore, and they all just shrugged their heads in quiet resignation of being afraid of what used to be and still is just a hop, skip and a jump away. You remind me of younger days. Probably 20 yrs since I crossed that border. Re: Immigration may be “nitro” (according to the article above)to the Democrats, but I sense Chuck and Nancy will get in a truck like in Wages of Fear and drive it. Because they think Medicare For All is a nuke. The big donors caring about life doesn’t go that far. I think you are right. They foment this stuff behind the scenes, then exclaim “stop, stop! Yes, they *know* Medicare For All H.R. 676 is a nuke. And the Trump administration threw a wrench right into an already broken down immigration system right after the meet in North Korea. They got off that subject too. And they created another “crisis” that manages to be profitable for the ever increasing privatized govt services. If there was no profit to be made, many of the changes would be able to get to. Non-profitable problems are more likely to be solved (in the current scheme of things). Duopoly at work for the big donors. Medicare for all, and affordable housing. Per Tom Stone below, there is some hope for the latter in western Sonoma county. Will Trump try to take credit for that? Wages of Fear, and the 1977 remake, Sorcerer, are two of my favorite movies. Please don’t get me associating them with Chuck and Nancy. I burst out laughing, but then was aghast at the thought. Not that he has a chance in hell, but still. I wonder if choosing HRC as a running mate would be considered an insult of sorts, or just another way for her to get close to what she’s entitled to. Bloomberg mulls a 2020 run. why is it ok for cake bakers to deny their services to gays, but it’s not ok to kick sarah sanders out of the restaurant? To make peace, maybe we all agree both are OK. But you have to tell the Republicans they’re being refused before you seat them. Once they are at the table, it would be too late. Remember, once they have been served ice water and gone through appetizers, to kick them out, the owner would lose money on what has been drunken and eaten, and the foregone opportunity cost of not having Democratic customers there, but the waiter or waitress would lose out on the tips as well. To kick them out at that stage is almost like harakiri. You really don’t want to give free food and drinks to those you hate, do you? The identity police were all up in arms about the bakery deal, but now when something similar happens to the “bad guys”, it’s to be applauded. Likewise, on the other side, it’s not OK to force a bakery to bake a special cake, but oh my, to refuse service to one of “ours” is horrible beyond belief. Let them heed cake, decision. Neither is okay, but it keeps people from mentioning the war. why is it ok for cake bakers to deny their services to gays, but not ok for employees to do so with job protections? Really F the entire system that would have owners have more rights than their employees just because they are owners. Family blog capitalism! P.S. I personally have no problem with gays, I’m saying look at who this “freedom of consciousness” stuff empowers and who it doesn’t from a CLASS BASIS. Lambert, reading your response to Goldberg’s piece, I was struck by your confluence of the 10%, which I have previously understood in reference to a credentialed elite, who defend their privileges by claiming meritocracy, and the Democratic party base. Were you using “base” in a sense other than it is conventionally used? Certainly as events progress, that credentialed elite may be all that’s left of the democratic base. See Thomas Frank, Listen, Liberal!. Democrats abandoned their working class base, and now their base is credentialed professionals (with occasional “firewalls” called in as needed, of course). when did that start though? i wonder if was the business plan developed in the early 70’s to “take back the country” from the so called leftists–or earlier, there was a constant pushback in the party to fdr’s reforms, not just from the republicans, and the democrats seemed to move rightward with truman, wanting to nationalize the steel industry to prevent a steel strike. So….do the repubs have anything at all to do with what is going on in the heartland? just a question…. > So….do the repubs have anything at all to do with what is going on in the heartland? Of course. Democrats should go in there, beat the Republicans up, take away their candy, and save thousands of lives. The suicide rate in the field of farming, fishing and forestry is 84.5 per 100,000 people — more than five times that of the population as a whole. Since 2013, farm income has been dropping steadily, according to the U.S. Department of Agriculture. This year, the average farm’s income is projected to be 35 percent below its 2013 level. In Minnesota a suicide hotline closed earlier this month after a budget dispute between the legislature and the governor. Between a Republican party aggressively closing foreign markets to farmers, and a bicoastal D party that caters to the media and venture capital-fueled economies of San Francisco, Seattle and Brooklyn, who the hell you gonna call? To paraphrase an old 1970s bumper sticker … next time you need food, call a hippie Democrat. Farm is a dirty four letter word starting with F and ending with Chapter 11. And government deficit spending to help the farmers would not be an option, because the national debt is too much already? Now I could spend the next half hour picking that apart bit by bit but I would never get that half hour back again. Let us just pick a few as being representative of all his points. “Safe drinking water”? Flint happened on the Democrat’s watch and was never really priortised. “They support global trade”. Hmm – like NAFTA and the TPP? Puh-lease! “Available health care”. Clinton’s “never, ever come to pass”. You get the idea. All of these problems have got the Democrat’s trade stamp all over them. They owned them for eight years and did nothing but put the boot in. The ruling political duopoly is broken. The Democrats represent only the bicoastal professional 10%. These are the managers and technocrats of the American military/corporate Empire. This is a lose organization of multi-national corporations and oligarchs who have bought out local government. Today’s multi-national corporations are similar to the first globalists; the Dutch East India Company or the British East India Company. Mid-America is now a corporate North American colony. Donald Trump will remain President unless he starts draining their accumulated wealth. The Democrats to survive have to give up their peer identity and jump off the donor gravy train. Fat Chance. For democracy to survive, a new party must arise to fight colonization and rising inequality; otherwise, authoritarians from both legacy parties will place a lid on the 90%. On this morning’s commute, I counted 10 residential “for sale” signs in less than a mile and a half. In Tucson, Arizona near the university and downtown. crikey, of course the exit polls were off. even when pollsters try to make a good faith adjustment, there is presumably a huge self-deception bias among respondents. if you are salaried and love pollsters and CNN, of course you’re happy to respond. If you’re in a trade/hourly, have small kids or a hold your nose and vote for Trump, or think CNN are elitists of course you’re not lot disposed to give pollsters 10 min of your time. Doing this requires that a browser supports something called “service workers”. Apple held out as long as they could but in March quietly threw in the towel. Safari now provides basic service worker support. What does this mean for Apple? Simply that app developers will no longer need to pass 1/3 of their revenues to Apple. Nor will they be subject to Apple’s capricious process where they decide whether they deign to allow your app into iTunes. That process literally includes a clause that says they can refuse apps “because we don’t feel like it”. Zuckerberg didn’t like being app-store dependent (Apple or Google) so he spent a coupla hundred mil advancing this tech (React.js). It also affords Microsoft a great opportunity to get their game back into mobile. Google are well-positioned because they are architected from Search at the back end, through to AI, Analytics, credentials and payments APIs, all to the front end, where Chrome has the best PWA support of all. Not sure what happens to Apple when their iTunes revenue dries up. It may already be drying up. Most people I know hate iTunes—I use Amazon Music. There’s a huge scholarly literature on nation-states, borders and citizenship. Because of course what matters to all true aristocrats is being able to eat in fancy restaurants where the waiters may be the biggest snobs. I’d say the problem is not so much that the elites were humiliated by their loss as that they don’t believe they really lost. A little pushback and these vulgar politicians will be put in their place. And of course the culture argument has always been used as a defense of inequality and the need for an elite. After all without wealthy patrons where would much of the world’s great art have come from? Kenneth Clark even once made a show about the history of art and called it Civilization. For him the other aspects of history were a mere sidebar. With Trump one never knows, but trying to snob him into submission may not work. The guy likes to eat at McDonald’s. RE: (2) I don’t see a principled description of the role of the state. “The first duty of the state is to protect — care for? — its citizens.” I hear this from conservatives, but it’s really a lot like FDR’s New Deal compact, isn’t it? Should the state control its borders? Concretely, should there even be immigration checkpoints? If not, what is the role of the state, since the distinction between citizen and non-citizen seems to have collapsed. I’d just remind everyone that, according to the “newzzzz,” american troops had to “leave” Iraq because the Iraqi government refused an american status of forces agreement that said that us troops were not subject to Iraqi law. “Porous” borders. Gate-crashing “guests.” Just sayin’. I would love to be able to retire to the country of my choice with no visa requirements, to escape our horrid health care system if for no other reason. Sadly, this does not appear to be on offer anywhere. Apparently the America of the future will be exceptional in that regard. Are there countries waiting in line to make this a real reciprocal thing? Do we have some Schengen in the works? Will this be remembered next week? I’m hoping we’ve moved on to the Famine in Yemen. Apparently the polls are showing a large plurality in favor of sending back immigrants while keeping families together (before sending them back) is also favored. Only 20 percent favored open borders. Clearly the public at large agrees that an American passport is a privilege worth defending. So regardless of the rights and wrongs the Dems may not be helping themselves politically. Remember the caravan saga? That seemed to play right into the administration’s hands. But what a P.R. fiasco this child separation has been. Quite the reversal of fortune, politically. As an electoral issue, none of the immigrants are voters or really potential voters. Its sad, but its the basic political reality. “The Emerging Democratic Majority” from 2002 more or less destroyed the ability of the Democratic Party elites to make rationale decisions about elections expecting random Hispanic voters to carry a party led by people like Tim Kaine who can repeat a few Spanish phrases to victory with no effort. I love how critics of open borders for labour assume citizenship must also be given alongside work permits. They are different issues entirely. Very true. It’s entirely possible to create cheap labor with visa only, or simply not checking. Her main claim to fame then is working on harassment issues. Harassment issues. Hmmmm. What happens if Goldberg gets booed by Trump supporters in restaurants or even refused service? Gets flack just doing her shopping? Maybe picketers outside her residence. After all, turn around is fair play. Or does she go the discrimination card? Or claim that she is a martyr to a free press? This is just virtue signalling writ large and is on par with not talking to people that don’t have the same beliefs that you do. That always works out well whether it is heartland voters or the Russians. But it does make you feel so, so virtuous and heroic. the tweets talk about ‘the left’ being the actors, not Dems or Liberals but ‘the left’. (Adjusting my foil bonnet to just the right angle.) I’d say this was a two-fer bank shot to both harass Trump employees and, more importantly, discredit the left and progressives (but not the Dem estab or liberals) to the larger audience. The tweets don’t say ‘Dems’ or ‘liberals’; the tweets say ‘the left’. This wouldn’t be the first time the estab used earnest young people as cats paws. If that’s what is happening. Dem elites are very down on the left because they are not. Nor are they the centrists they claim to be. They are right wing reps diligently doing their donors’ bidding, whether pro war, open borders, crappy med, grand bargain, or whatever other looting the overlords want next. Their one job is to keep progressives from power, and they will do that if it means no dem ever wins a race again. So AP and Fox have gotten together with the University of Chicago to develop exit polling that will more closely echo election results from Republican leaning corporations ‘secret proprietary programed black box voting machines. Wha more can I say?. No open thread for primary elections tonight? Vox has Ocasio-Cortez beating Crowley based on reported results right now. 82% of precincts reporting, Ocasio-Cortez still in the lead. It’s been called for Ocasio-Cortez. Let’s hope she means what she says once she gets to DC. So who wants to stock up on Cortez 2028 campaign memorabilia? Or even 2024. She will be 35. The Democratic Party bench is pretty scant, so we have to overlook age. I hate Crowley, so I’m a bit excited. Wow. They’re calling it. Ocasio-Cortez is projected to beat Crowley. Look out Mario…. And look out leader Pelosi! Bigger than David Brat beating Eric Cantor in my book. Super campaign by Ocasio (that video! The “lens” metaphor!!). Good pick by Brand New Congress. And especially impressive was that other campaigns came to Ocasio’s aid — while she left to go to the border. This is huge. For the first time this cycle, the left has drawn blood. Against a consummate insider. Can’t wait to see how Pelosi (“people don’t want change”) spins this. Ben Jealous won MD governor primary. That’s good, too. Good night all around. All in all, the Democratic Establishment must be nervous, and probably trying to scheme on how to sabotage or co-opt these new Berniecrats. Even if Bernie does not run in 2020, at least he will have inspired many more politicians to try to run for office.